Acappella All Stars Show A Smash Hit! The first of October the Sound Celebration Chorus presented our annual show, A Cappella All-Stars. We had two shows, a 2:00 matinee and a 7:00 evening show. Our A Cappella All-Stars show not only showcased the award-winning, talented performers in our area, but also was the debut of our Harmony Classic set and served as a send-off on our exciting journey to Las Vegas and International Competition. And what a send-off it was! Just two weeks earlier we debuted our Harmony Classic set at Region 5's Music School, Tribute to the Top. We had so much fun there and received such rave reviews from a barbershop audience that we were anxious and excited to bring it back home to our show audience. Under the direction of our talented director, Terry Ludwig, the chorus opened the show by singing a concert portion featuring our favorite repertoire songs. We heard later that the two show-stopping songs at both shows were The Prayer (it was one of those "you could hear a pin drop" moments) and Time After Time. It just so happens that Time After Time was one of the songs from our 2015 Regional Contest that qualified Sound Celebration to compete at Harmony Classic in 2016. When all the scores were tallied we were the fourth highest scoring small chorus (26 on stage) in the WORLD! The next award-winning guest performer was Great Day Quartet. 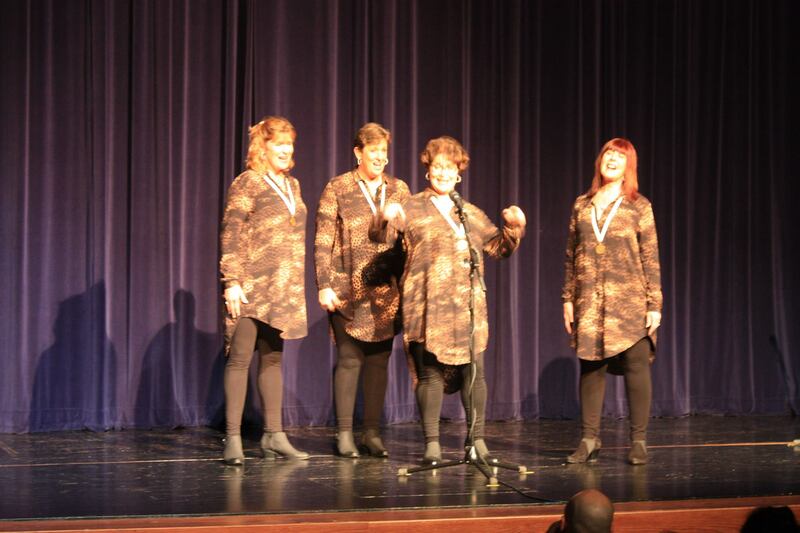 Fifteen or so years ago they were Region 5 Sweet Adelines quartet champions two separate years and when they recently got back together, they took the Harmony Inc. world by storm. They won their Area 4 contest in 2015 and went on to place THIRD in their International Competition. The bass in Great Day, Roseann Haven, is a member and past director of the Sound Celebration Chorus. They performed a fabulous set on both shows and we are so happy to have had them join the all-star line-up. We had a 50/50 drawing as well as drawings for two exquisite gift baskets created by our own and very talented Linda Claussen. A portion of the show proceeds as well as proceeds from the basket drawings go to help fund our Vegas journey. Linda is also this year's SCC president. Our director's "other" chorus was next to perform. 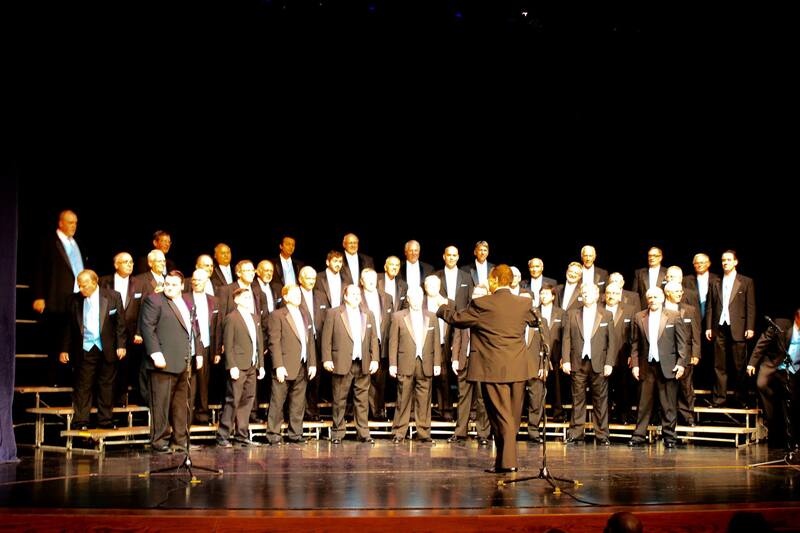 Terry also directs the Barbershop Harmony Society's Sound of Illinois Chorus from 60 miles north in Bloomington, IL. Just a week earlier SOI competed in the Illinois District Contest and won the Illinois District Championship and qualified to represent their District and return to International Competition for the 13th time!!! See what we mean by all-stars?!? They did an awesome job and we were so lucky and so grateful to have had them perform. We aren't sure but our show was the only (or, at least, few) times that all three North-American international barbershop groups have been represented on one show. We saved our Harmony Classic set for last... but certainly not least. We wore our special costume and equally unique make-up (the pictures say a thousand words) and buzzed onto the stage carrying our props just as we will do at International. 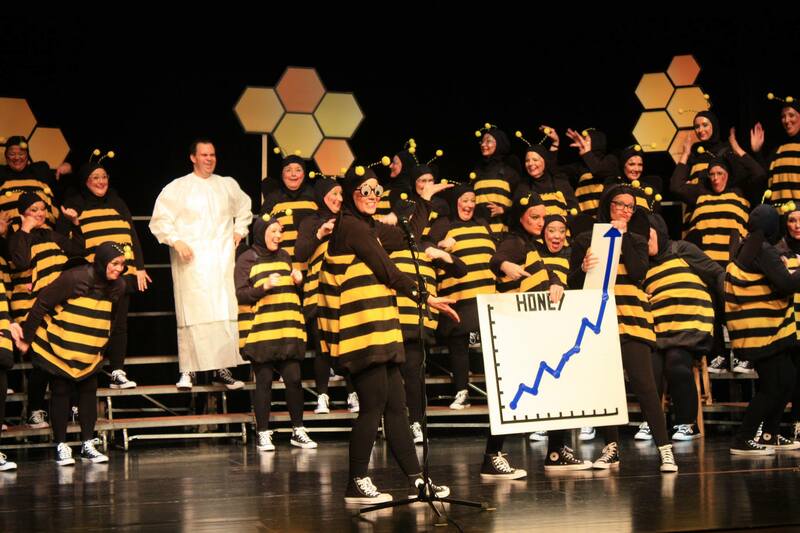 Needless to say, we are pretty sure we BEE-witched AND BEE-dazzled our audience! We are aiming to do the same at International Competition on October 18. Wish us luck! Show Chairmen, Tracey Wobig and Julie Brennan, want to thank all the Show Committee Directors and their committee members for all their hard work on the Harmony Classic set and the show. We are so excited for this next chapter in our chorus lives. LET'S GET READY TO BUMBLE! Look out Vegas, here we come!